Don't let the name fool you, lovelies ... this treat ain't for puppies! 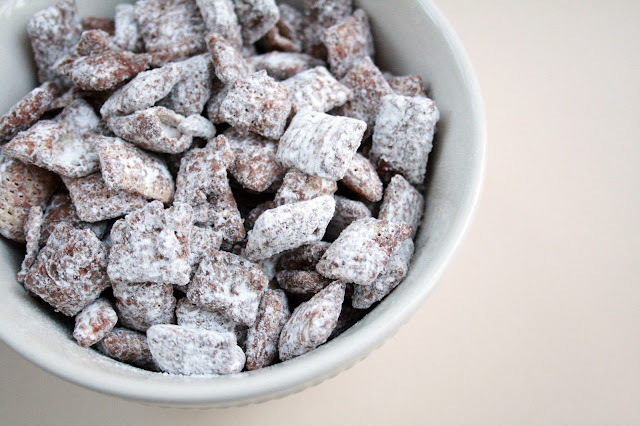 Known in some parts of the country as Muddy Buddies, I was first introduced to this out-of-this-world treat by my friend (and stylist) Amy Keller. I've since made it on my own and packaged it for my annual holiday homemade-edible-tasty-treat gift boxes. Let's just say I'm glad I only allow myself to have it once a year because it is addictive. Truly a crowd pleaser! In a large stockpot melt the butter, peanut butter and chocolate chips together. Stir. Add the box of Chex and stir to coat. Place powdered sugar in grocery or Ziploc bag. Pour in cereal mixture and shake until all pieces are coated. Very true about butter measurement in this recipe. So, do you need a stick of butter, or 1/4 cup? Makes a difference, I think.